Khari boondi is a favourite snack to munch on at almost any moment. Enjoy the amazing taste of tangy and spicy Khara Boondi Namkeen. Eat it as a side dish with your meals or just eat it on its own. Or spice up your life even more by making it a full-fledged evening snack to serve to guests or to enjoy it alone. Cut up some cucumbers, onions, tomatoes. Sprinkle a bit of pepper and any other herbs; add a dash of lemon and a very tasty dish is produced! 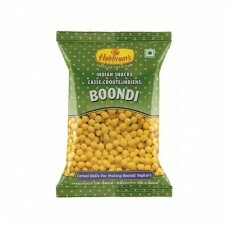 Or mix it with curd and make the very popular boondi raita and have it with your food.